My thesis here is a modest one: that prolificacy is sometimes inevitable, and has its place. king’s point is that writers like he and oates needed to write that much, it’s just part of how their process works, and that many extremely profligate writers have had a very big impact on literature. as for the idea that “minor works” of profligate popular writers get lost in the shuffle, i’m sure they do. but they still get more attention than the major works of many minor writers. If you are dealing with an author who is prolific and you want to know which books you should read and which you should not, or should defer until later, why not do a little research first to help you decide? BTW, I’ve never heard anybody say that Shakespeare wrote too much. Also, how much better might King or Joyce be if they had focused that energy? Imagine if Stephen King spent 5 years pouring over one book, instead of producing 7 or 8 books in that time? While King always defends genre as “just as good as literary fiction,” I think it’s no coincidence that the prolific authors are all genre: it’s easier to write and they’re worse writers so they don’t spend as much time. Not all prolific authors are genre. Isaac Asimov wrote both science and science fiction. The problem isn’t that some authors write too much, it is that some authors publish bad books when they (and/or their publishers and editors) really should know better, and/or publish books which could have been much better with more work. My favorite example is Paul Auster, who has written some of the most memorable books I have read in the past 15 years, but who simply writes way too much: some of his books are just plain bad (most painfully his failed attempt at a comic novel The Brooklyn Follies), while others could have been much improved with more work (Invisible and Sunset Park, for example). The problem with musicians, especially jazz musicians, is somewhat different – since it is so easy and cheap to make a recording, the temptation is to release way too many recordings, which makes it hard for even a devoted fan to figure out which work bears serious, repeated listening. The great David Murray is the worst offender I know of in this regard. I must agree with you on the dangers of writing too much. You could make an impressive bibliography just out of King’s truly awful books (“Christine”, “The Tommyknockers” etc). But I must take issue with the way you dropped “Moving On” among Larry McMurtry’s lost masterpieces. Actually, it’s the centerpiece of a group of wonderful books, including “All My Friends Are Going to be Strangers”, “Terms of Endearment”, “Somebody’s Darling”, “the Late Child”, “Some Can Whistle”, “Texasville” and “Duane’s Depressed”, the last two of which tie the other novels in with “The Last Picture Show” . It’s quite a cycle of books, and well worth reading. BTW, this goes for musicians, also. After the Beatles broke up, Paul McCartney routinely put out albums with just a couple of good songs. Why not delete the chaff and put out one great album every five years? One answer might be that his best and most exigent critic was no longer on hand to help. I would think, however, that an author or a musician would not necessarily know whether or not their creation was “great” or not. And there is the question of selling books/albums in order to make a living. I’m sure Danielle Steel has no reservations when she cranks out her romance novels. Don’t nitpick – obviously the article is talking about fiction. Yes, Asimov wrote some nonfiction science books but if Isaac Asimov isn’t a genre writer no one is. I’d say pretty much all the prolific authors are genre: it’s why they can pump out book after book based on templates they know well and are expected to stick closely to. The hero’s journey, etc. Great article. I can’t wait to track down everything the author has written for The Believer, Tin House, The Daily Beast, Electric Literature, and others as well as his first novel, Arcade (Unnamed Press), forthcoming in June 2016. Just like every other prolific columnist/website/reporter I love because that’s a thing that people do. I mean, I can’t miss that one great article he wrote just because there’s bunches! But do I have the time? Oh, man, I spent too long making this comment. Hey, I wonder if people out there read these… I’ve got comments on such websites as Cracked, NYTimes, iO9, and Lifehacker, track down all my comments today as well as my website! This is easy, this commenting on something. Hope there’s not too many comments out there of mine that people won’t be able to judge the best… Oh well, maybe somebody one day will curate my comments and articles like this one. What strikes me is when logorrhea meets Emerson’s saying something like that poetry demonstrates the tremendous power of a few words. That is, King is what I am, a recovering alcoholic, and sometimes we can’t just shut the blank up. There’s something about each moment and each word. And then J.C. Oates, whose work I’ve never been able to find a way in to – I began reading her current NY Review of Books article and began skipping through it when she started knocking inspiration. She ended with what I took to be a paean to other-direction, which is not where the work of my favorites comes from. Yes, I’m being too severe. Lots of things don’t have to be great to be great. But one thing I’m not, about their prolificity, is jealous. This article makes be frantic and gives me hives. 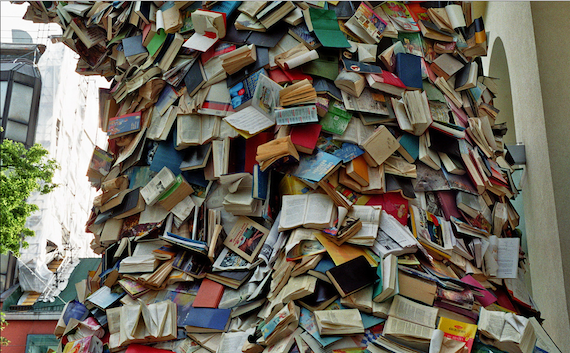 Don’t remind me how many books there are… and also that there isn’t enough Flannery O’Connor. Drew, You have a compulsion to finish – the prolifics (JCO, SK, etc – but not the Pattersons, those are just sausage makers) have a compulsion to write. I never published a line, most likely never will, and still I need to write an hour or two each morning before work just to get my head straight. Why should the prolifics stop doing what they need to do just to make it easier for completionists?? It’s not something you can moderate. I’m firmly of the belief that writers can write too many books. John Banville is one and so is Peter Carey. Possibly Ian McEwan. The originality of their earlier works is lost and they become mere technicians. Good technicians, perhaps, but the first fine careless rapture is gone. Lots of grain to grind in the mill from this piece and the comments. Evan, you made me laugh as well. Cheeky! a.) Could a focus on too much, or too little productivity cause a discombobulation in the creative “pipes?” To get a little earthy, reminds me of someone who is too apt to wield the Ex-Lax at the first sign of constipation (or vice versa). Seems risky to create a self-consciousness about creative flow. Are there some books a writer “must” produce (presuming they are in themselves fully realized, see below) so that a much greater work of art may rise to the surface? c.) Distinguish books referenced in b.) with products that are clearly not fully-developed. For example, I have seen every Woody Allen movie, and found “To Rome with Love” the greatest disappointment. Beautiful cinematography, but clearly many vignettes were a good several drafts short of what they could be. On the other hand “You Will Meet a Tall Dark Stranger,” was minor Woody Allen, but I found it an amusing escapade and passable as light entertainment, on its own terms. Finally, after the darkness and body horror of “The Skin I Live In,” Pedro Almodovar’s air-travel themed farce, “I’m So Excited” seemed a light and refreshing palate cleanser. Looking forward now to his next film, set in the 1980’s. d.) Prolific and excess must be distinguished. Overwriting is a failure of technique (does the writer need to improve his self-editing skill?) or perhaps a failure of character (does the writer believe he is too grand now to need an editor?). What would you have Banville or McEwan do, spend 2-4 years researching, writing, and editing a book, and then give it a read and say, “Well, that’s not quite up to snuff, back to the drawing board.” That’s just not realistic, or how artistic creation works. For one thing, when you have a huge amount of time sunk in a project, you tend to think its worthwhile. Public opinion may not bear that out, but you simply often don’t know. Also, artists and especially prolific artists tend to get to the wheat by producing chaff, but some chaff is chaffier than other chaff. And then there’s the fact that you make a living, or some of your living, selling books to publishers–there’s something of a cultural double standard implicit in the position that artists should float above the concerns of commerce, presumably living on a magic cloud and meditating, in order to produce an unimpeachable masterpiece every fifteen years. While I agree that in theory, it would be sort of nice if all authors were Flannery O’Connor, with the good grace to die at forty and leave four good to great books as their easily digestible legacy, it seems a bit churlish to desire this in reality. And actually, Wise Blood and The Violent Bear it Away, aren’t really up to the standard of her stories. Maybe she should have just left the collections. Maybe she should have only written A Good Man Is Hard to Find. Now there’s a career! To move further back in time: I think too many people refuse to read Trollope because there are simply so many books. That’s a shame, because the marriage of Glencora stands as one of the best portrayals in literature of that state. I find almost all of Trollope’s novels of value (he was a Freudian before Freud, and a feminist despite his ridiculous remarks)–but maybe he’d been better off if he had only written the Palliser novels. Some prolific authors are better writers than other prolific writers. I’ve read many novels that were pretty good but forgettable that if the writer had spent another year on could have been memorable. If a prolific writer writes 100 great novels there’s no problem. But what if they wrote 100 pretty good novels? Would readers and the writer’s career been better served by writing 25 very good novels, or 12 great novels? Isaac Asimov is mentioned above for writing 500 books, but even his most memorable ones are very poorly written, and will soon be forgotten. Quite right. Even among the very greatest writers, only a portion of their writing is truly memorable. I think it was Teddy Roosevelt who once apologized that he was sorry the letter he wrote to Mr. X was so long, but he just didn’t have time to make it shorter. But when a writer can’t self-edit, there’s no problem. The reader will edit for him. P.S. In King’s case, I read Carrie, Hearts in Atlantis, and On Writing. And stopped there. Being prolific doesn’t always mean poor writing. Unlike those who write literary fiction, genre writers don’t labor over style (which is largely invisible, subservient to imagery and plot). What’s remarkable about Asimov’s writing is how consistently good it is (“good” on the level of thought, extrapolation, lucid and compelling prose). I don’t believe in disowning writers I grew up on, and I’m glad I can still enjoy them. Asimov has inspired generations of scientists and young people, as well as broadened our knowledge of the world beyond the small human. Do we have the right to dictate what a writer writes? How do we know if Stephen King self-edited that only The Shining and The Gunslinger would have been written, and it would have been Tommyknockers that he decided not to go forward with? Its just as likely that those would be the ones that he produced (maybe they would be better, but maybe not). And I’d like to think that authors learn as much from their not-so-great works as their great ones. Also, a lot of the “limited” authors died early and tragically … so … are we supposed to wish that happens to the authors we really like?